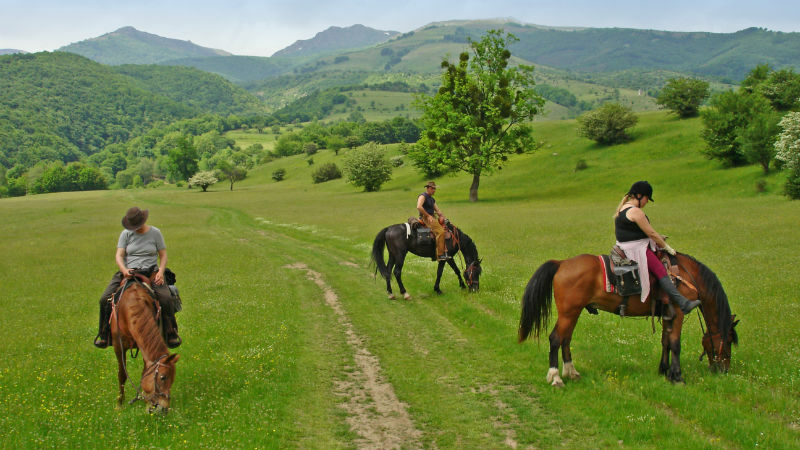 Horseback Riding In Bulgaria - Trail To The Singing Rocks. Horseriding Tours In Europe. 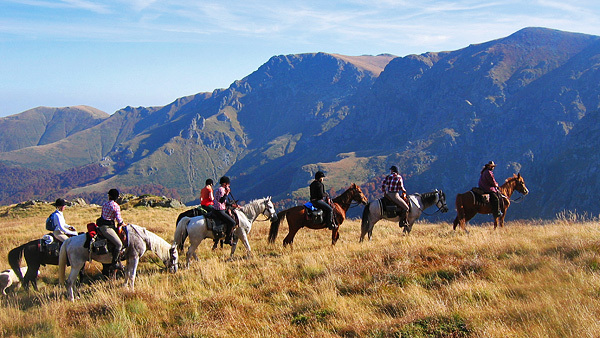 An equestrian adventure in the heart of the Balkan Mountains and the Central Balkan National Park, where lies the impressive reserve called The Singing Rocks. This is an exceptional rock phenomenon, which derives its name from the typical sound, resembling whistling, when the wind blows between the crags, that crown the ancient Beech forest. The reserve is homeland to many endangered species like Golden Eagle, Brown Bear, Ural Owl, White-backed Woodpecker etc. The riding to the reserve is very varying as to the terrain and pace. The hilly paths and the open treeless meadows on the top of the mountains are just created for big riding experiences. The trail in the Balkan Mountains is going through a protected area. The air is as clean as the creek we ride through – over – along. And the sceneries of the surrounding high peaks and massifs in the area are just breathtaking. After a few days you will get familiar with the peaks Mt. Botev (2376m), Maragidik, Mazalat etc. Riding on-top of the ridges you will experience the differences in the northern and southern sides of the Balkan range – two faces of one glorious mountain, which is also the longest one in Bulgaria. Day 2. In the morning you will meet your horse for the first time and will be able to fall into your horse’s ways during the introduction ride around the charming small town of Apriltsi. Around noon we will make a short stop for a picnic near one of the rivers. Eventually we ride back to the riding base along different route, trying our horses following different paces. Day 3. After breakfast we start the trail heading North-East through remote tiny villages and small rivers, where we will also stop for lunch. After some 6hrs in the saddles we will end up in Batoshevo Monastery for overnight. Founded in the 13th century and destroyed several times afterwards by the Turks, the monastery nowadays has managed to preserve the architecture typical for the National Revival Period as well as a number of impressive icons and iconostasis. Day 4. Starting from the monastery we continue on through dense woods, farmland and nimble creeks until we reach the charming mountain villages of Stokite and Kupen. From here we start riding up. The ride today will be appr. 28km, taking some 6,30hrs. Today we will cross the altitude of 1000m a.s.l. and continue up to our lodge for the night. Day 5. The mountains still await us. After some 3hrs after breakfast we will reach “Partisanska Pesen” hut, where we can have lunch. The afternoon will be spent on the top of the mountains in the Central Balkan National Park. In a couple of hours more we will get to “Mazalat” hut, where we will stay for the night. Day 6. The trail takes us further into the national park as we ride towards The Singing Rocks reserve. If the wind is blowing we may be lucky to hear the rocks sing. In the reserve itself there are two short stages where you will have to get off and lead the horse for some 20-30m. The ride today will be roughly 25km and we will need about 7 hrs to complete it. Overnight stay will be arranged in formed dairy, situated at about 1450m a.s.l., where we will be able to watch the sun going down behind the peaks Botev and Maragidik as we have dinner by the fire. Day 7. After breakfast we will ride backwards in the northern direction, closing the ride circle. We ride down the mountains, leave the national park and eventually arrive in Apriltsi and the riding base nearby, which we already know from our first two nights in the area. Farewell dinner in the evening. The trail is based on 7 nights. 3 nights with private accommodation in Apriltsi (2-3 bedded en-suite rooms), 1 night in a monastery and 3 nights in a mountain hut (2-5 per room; shared bathroom). The trail is with full board. Mineral water is included at all meals, but other drinks are to be paid on spot in leva. Accommodation in 2 or 3 bedded rooms. Single room on request only (against additional fee).You have access to a bathroom every day but not in the room every day. The price includes: transfer from/to Sofia or Plovdiv airport, accommodation as mentioned above, 7 nights with full board, fully equipped ”own horse”, English-speaking riding guide during the trail and luggage transport.